Today we’re headed out of Christchurch on a train to the west coast. There, we’ll pick up a car and do some touring before we head roughly towards Antarctica to see the rest of the South Island over the next week or so. 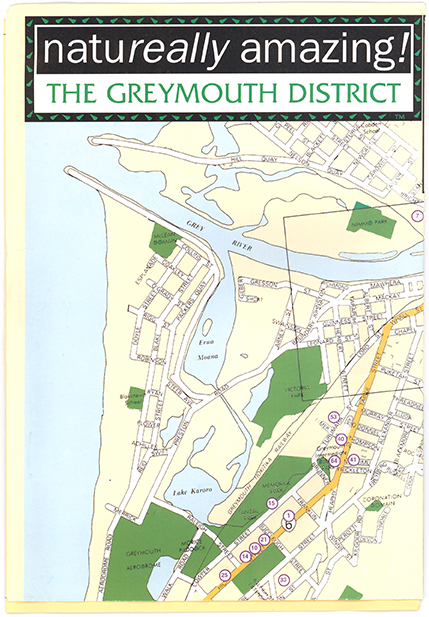 In this pre-GPS, pre-Internet, pre-smartphone era, we will be navigating with paper maps around a country we’ve never visited, while driving on the wrong side of the road. There is one hitch in our plans. Laura has food poisoning from lunch yesterday. It was a rough night, and we awake wondering if riding a train through the mountains is the best way to start the day. Laura’s feeling better, so we decide to go for it. 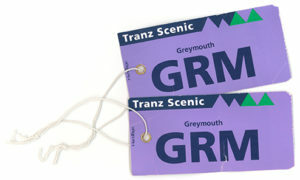 Off to the train station to catch the TranzAlpine – four hours through the mountains to Greymouth on the west coast of the island. The TranzAlpine is billed as “New Zealand’s most scenic train ride.” It’s a great trip through Arthur’s Pass National Park and down towards the Tasman Sea. We have mist and rain, so we don’t get the full view. This is still a stunning ride though. Once we clear the Canterbury Plains, we start up the Southern Alps. Laura’s doing fine, so we settle in and enjoy the view. We only jump out once, at Arthur’s Pass, to soak in the highest spot on the route (and soak in some raindrops). 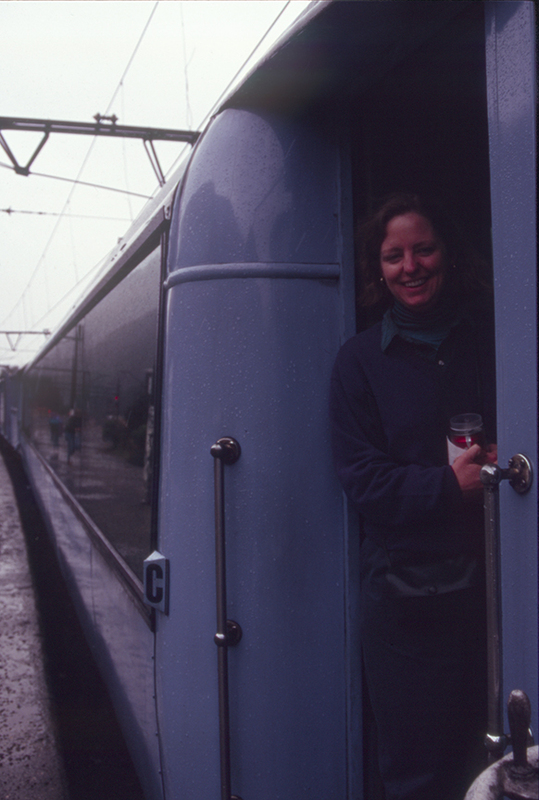 Then it’s back on the train and down to our destination at the mouth of the Grey River. The weather starts to clear on the west side of the Alps. This is good news, since our next destination involves an outdoor hike right along the coast. But before we get to our hike we have more logistics. In Greymouth, we claim our rental car. Ah, the open road! We talk to the agent (“Thank you very much, we’re very happy.”) briefly, and she offers no instructions at all. I remind her that we are from the U.S. and ask if she has any instructions. She says, “Just don’t take the car down any gravel roads.” Okay then. We go around the corner to find the car, which is a lavender Ford, and put our luggage in the trunk. I ask Laura if she wants to start out. She declines. Okay then. I get behind the wheel on the wrong side of the car and start driving. As Laura observed later, it might have been a good idea to go around town a little bit first, but I was more worried about multi-lane streets and stoplights with right-turn arrows, so I hit the Coast Road (Highway 6) and started north towards our hike. It is scary driving a two lane road with traffic whizzing by the other direction off your wrong shoulder. I’m cheating a bit away from the center line, but since we’re heading north, that’s putting Laura uncomfortably close to the steep dropoff to the Tasman Sea. We just can’t win. Lots of laughing and shrieking as we get the hang of keeping to the left. 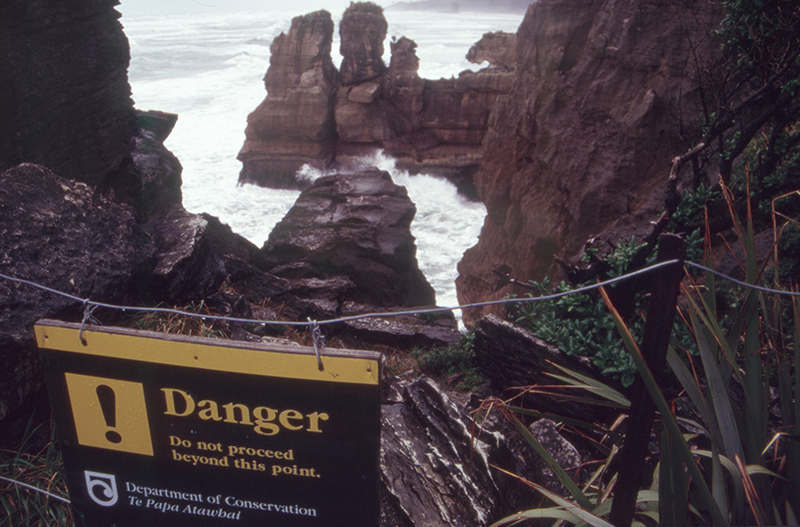 Our destination is the Punakaiki Pancake Rocks and Blowholes, about 40 minutes north of Greymouth where the south end of Paparoa National Park meets the sea. This is quite a spot. 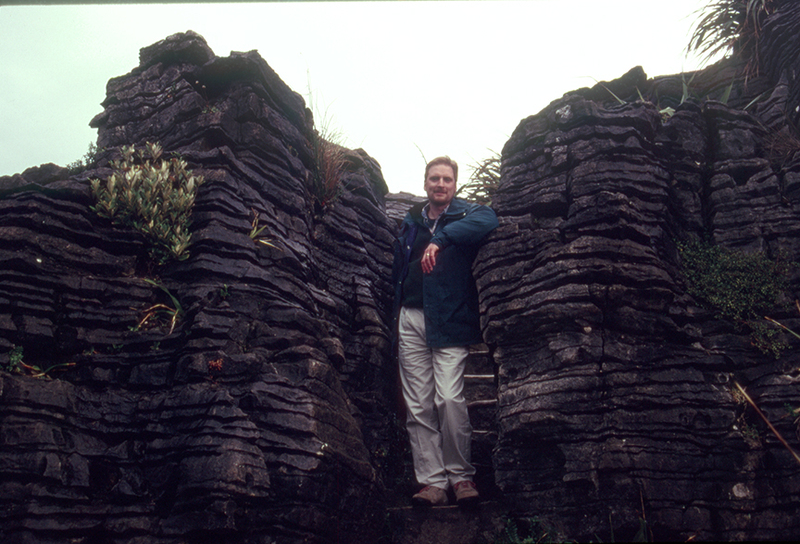 Tropical plants, pancake-shaped rock formations, blowholes, a very angry Tasman Sea, and the weather changes every minute or two. It’s a tough day for photography, but we keep trying. The loop trail is supposed to take twenty minutes, but we spend nearly an hour in this weird space on the edge of the island. We’re on the west coast, but this is the Tasman Sea, and the Pacific Ocean is the east coast here. Somewhere over yonder is Tasmania. Somewhere down that way is Antarctica. The sky begins to brighten as we finish the loop. The sea is still angry, but we welcome some sun. This is as far north as we’ll be for a few days; we turn south and return to Greymouth for a late lunch and then continue further south to Hokitika. In Greymouth, we learn the big news of the day. Ted Kaczynski, better known as the Unabomber, has been captured by authorities in Montana. Kaczynski was notorious enough for his acts of domestic terrorism that he made the news in New Zealand. There isn’t a whole lot to Hokitika, except some beach hotels, a beach, and a few restaurants. The Southland Hotel isn’t much to look at from Revell Steet, but the view’s out back anyway. It feels like we’ve come a lot further from Christchurch than we actually have. That’s what I call a good day. 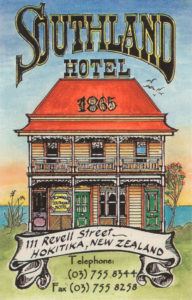 The Southland Hotel is now called the Beachfront Hotel. The Unabomber is still serving the first of his eight consecutive life sentences.